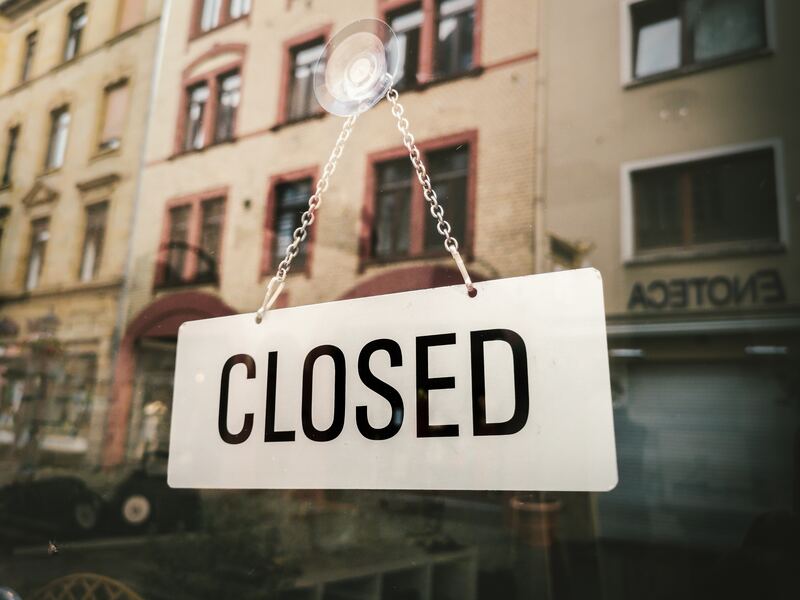 Lauren Thomas’ March article on store closings states that so far in 2019, more than 5,000 stores have closed their doors. Gap, Victoria Secret, J.C. Penny, Tesla, and Abercrombie & Fitch are just some of the big names experiencing closures, according to Coresite Research. Even Amazon is closing its pop-up shops inside of Whole Foods, Kohl’s and various mall locations. With all this activity, we wanted to figure out if our data lined up and see if we could spot any trends in the industry. Bitvore does precision analysis. We weed out any articles that don't include a material event that has potential financial impact, duplicate news items or those which are not the first in a cluster of similar stories. We identify specific “signals” using machine learning and AI models that have been tuned using tens of millions of news articles and other data. Examples of signals Bitvore identifies include Mergers and Acquisitions, Labor Issues, Facilities Issues and Executive Changes. 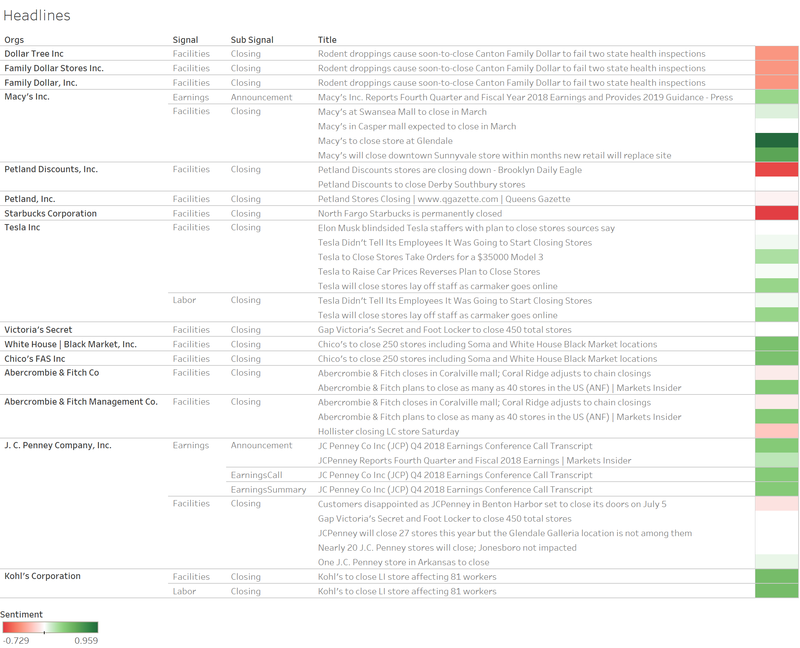 The Bitvore platform has identified 335 precision news items in 2019 thus far related to store closings. The first check we did in our analysis was to make sure all the high profile names in Thomas’ article were well covered. In fact, news stories about Gap, Victoria Secret, J.C. Penny, Tesla, and Abercrombie & Fitch all show up in our precision news. Below, the Q1 company's we identified a signal for are broken down by month. Each company is represented by a different color, and the size of the company name represents the amount of news related to our Facilities and Closing signal/sub-signal combination. Bitvore faces several challenges when analyzing content. The first is we have to automatically distinguish between a local Starbucks closing one location, a string of Starbucks closing in a market or geography, or a corporate initiative to close a large number of stores. Another challenge is mapping the analyzed data we can derive from the content to actual corporate entities. For instance, Chico’s FAS Inc. and White House|Black Market are two closely related entities, as one is owned by the other. In addition, decisions made at Sears Holding Corporation as a corporation aren’t always the same type of decisions made by Sears Hometown Stores, which is the consumer-facing branding of the public stores. Similarly, Dollar Tree, Family Dollar Stores, Inc., and Family Dollar Inc. are all related, but sometimes need to be split out when talking about specific strategies or stores. We also have to make sure the signals are applied to the correct company. Amazon closing their pop-up stores inside of Whole Foods, Kohl’s and other mall locations doesn’t mean that Whole Foods, Kohl’s or the malls are assigned the Facilities and Closing signals. If a Facilities and Closing signal/sub-signal is assigned to Kohl’s, we want to make sure it truly is about Kohl’s and not Amazon, as even though they clearly are entities mentioned within the same article, that would be misleading and not the intent. Luckily, we have deep expertise figuring out all of these issues. The next step we examined was the sentiment related to store closings. How does the market perceive the closings? Not all store closings are bad. Some cut costs and improve the company's financial position. Others abandon misguided or poorly received strategies. Below, we look at the sentiment for all the store closing precision news in 2019. The length of the bar is the total number of critical stories related to closings for that company in the first three months of 2019. 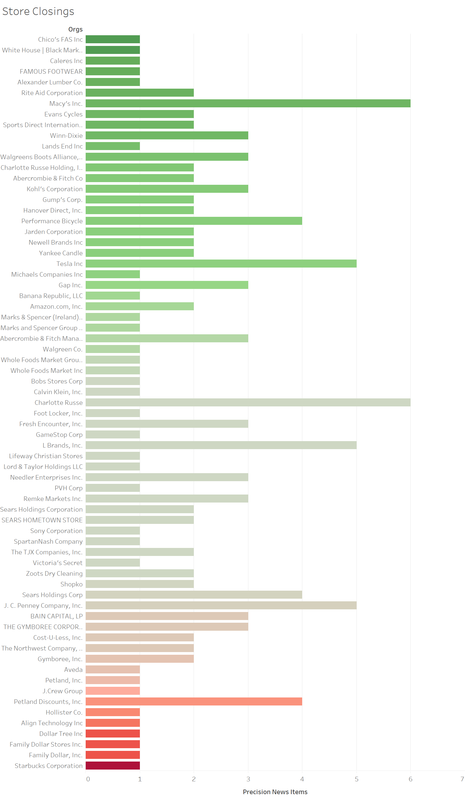 The color represents the average sentiment across the stories for that particular company. Green is positive, and in fact, the Chico's & White House|Black Market store closings were typically seen as a very positive move for the company. Macy’s reduction of stores was seen as a good thing also: protecting their brand and ensuring profitability. On the other end of the spectrum, Starbucks’ store closings were seen as extremely negative, though the news was only related to two local stores, this did not represent a shift in the company strategy. The trio of Family Dollar stores did create major headaches, and the 85 closings and announcement of future closings of up to 390 was seen as a severe sign of retail weakness for the chains, despite sales growing at a modest pace. One of the other things we often do is to dig down into the signals, sub-signals, and titles of the news stories to try and get a sense of what types of stories surface as significant, financially impactful, and material. For a sample set of companies below we included the relevant headlines and sentiment for each headline. Tesla's headlines reflect their store closure announcement surprising employees. Dollar Tree has insult added to injury with a store that was closing anyway “really” shutting down due to failed health inspections. Also captured is Kohl’s closing a store, and not just co-mentioned with the Amazon sub-let store shutdowns. Interestingly, when a specific store location is closing, it typically receives a very bad sentiment rating, however when large numbers of store closings are announced or actually closed, the sentiment scores tend to be less negative. We can suppose people get upset when their local store seems to be the only one closing. The majority of store closings for 2019 looks to be primarily related to clothing and retail, with a few other industries sprinkled in. 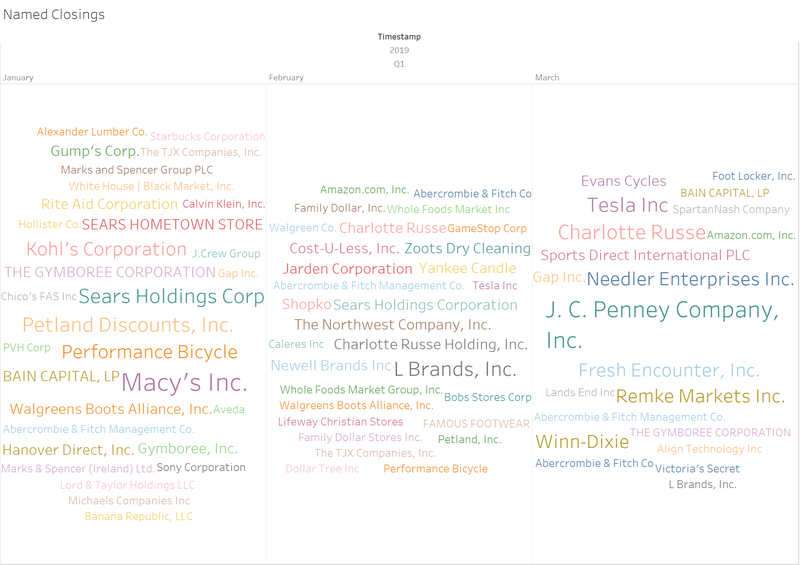 While we don’t track the actual number of stores closings across all the companies (i.e. 4,000 versus 5,000 etc.,) we do keep track of critical news of facilities changes specific to individual companies in an automated way. Using AI techniques, we can figure out what's important to know, not by the volume of mentions of given situations, but by quality of precision. While analysis firms can keep track of the store tallies, precision intelligence can uncover WHY it’s impactful and who it will affect, much more so than just looking at numbers can. Want more critical information on corporate facilities changes such as locations opened and closed, expansions, renovations, or new leases? Subscribe to our free Bitvore Corporate Facilities Brief and get the latest updates right in your inbox. Greg is a serial entrepreneur who has founded three angel and VC-funded companies. He's been involved at an early stage or as an advisor to at least half a dozen more. Greg has a PhD and BS in Information and Computer Sciences from UC Irvine and a MS from USC. 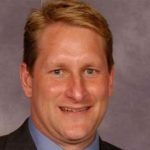 What Will 2019 Look Like for Cybersecurity Mergers and Acquisitions? Who is really adopting AI in their industry?